Washington – A coalition of environmental groups that oppose the federal government’s plan to sell Plum Island to the highest bidder are making progress on several fronts. The General Services Administration, tasked with the sale of the island in Long Island Sound, has agreed to conduct a new environmental impact study on the proposed sale of Plum Island. In addition, several bills that would block the sale are under consideration in Congress, while the coalition of groups and lawmakers seeking to keep the island as a conservationist sanctuary is growing. “Things are moving in our direction,” said Chris Crider of the Preserve Plum Island Coalition, a group of environmental and conservation groups that include the Nature Conservancy, Audubon Connecticut and the Connecticut Fund for the Environment. For decades, the U.S. Department of Agriculture ran biological experiments on animal diseases, working on animal illnesses like swine flu and foot-and-mouth disease, a highly contagious livestock illness. But the U.S. Department of Homeland Security is now in charge of the National Bio and Agro-Defense Facility that will be built in Manhattan, Kansas, shutting down operations at the animal lab in Plum Island and building a higher security facility in Kansas. Congress voted in 2008 to sell the island to the highest bidder after it was decided the animal disease center would be moved to Kansas, a move scheduled to be completed in 2022. The island encompasses 840 acres and, although it is owned by the U.S. Department of Homeland Security, it is considered part of the town of Southhold, N.Y. The proposed sale touched off local opposition and a growing movement to halt the transfer of Plum Island to private owners that has drawn national interest and the support of federal lawmakers from Connecticut and New York. While the federal government has not backed off its plan to sell Plum Island, it has to clear new hurdles before it can do so. The Connecticut Fund for the Environment and a handful of other groups sued the Department of Homeland Security and the GSA in 2016 to halt the sale, saying the environmental impact study the federal government conducted did not consider the impact to endangered species on Plum Island or the habitat of other animals on the land and in the sea. The sale of the island is aimed at raising money to help defray the cost of building the new facility in Kansas. But the lawsuit, slowly making its way through U.S. District Court in New York, seeks to require federal agencies to consider conserving the resources on the undeveloped portion of the island — some 600 acres — either through a sale to a conservation group or turning the land into a federally protected area. Cryder said the first environmental impact study the federal government conducted to pave the way for the island’s sale “had huge deficiencies” and failed to include any conservation alternatives. 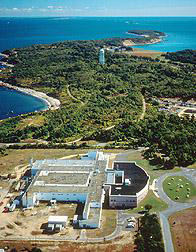 The GSA announced last month it would conduct another environmental impact study of Plum Island. The new study would take into consideration a biological inventory of Plum Island prepared by New York’s Department of Environmental Conservation and the Nature Conservancy. “Few publicly owned islands are as poorly known, misunderstood, and shrouded in mystery as Plum Island,” which has been off limits to most visitors for decades, the report said. The GSA ‘s new environmental impact study will also take into consideration any activities undertaken by the U.S. Fish and Wildlife Service on the island and the zoning plan for Plum Island adopted by the Town of Southold in August 2013. Southold sought to safeguard Plum Island by rezoning it so only nature preserves, parks and museums would be allowed. The lawsuit is not the only step those opposed to the sale of Plum Island have taken. They have, in the past three Congresses, sought approval of legislation that would help their cause. There are four separate Plum Island bills pending in this Congress. One, sponsored by Rep. Lee Zeldin, R-N.Y., would require the federal government to come up with alternatives to selling the island that included transfer of the property to another government agency or nonprofit entity for use in education, research or conservation purposes. The bill has passed the House, but not the Senate. Another bill, sponsored by Sen. Richard Blumenthal, D-Conn., would flat out prohibit the sale of Plum Island. No action has been taken on the legislation. The best chance of stopping the sale is a provision Zeldin put in a House spending bill that would fund the GSA. It would bar the agency in fiscal year 2019 from selling or marketing Plum Island. The Senate version of the bill does not contain that provision. Last week, Blumenthal and Sens. Chris Murphy, D-Conn., Kirsten Gillibrand, D-N.Y., and Zeldin, along with Reps. Joe Courtney, D-2nd District, Rosa DeLauro, D-3rd District, Kathleen Rice, D-N.Y. and John Faso, R-N.Y., wrote congressional appropriators to keep the ban when they negotiate a final version of the bill. “Constituents in our two states oppose the sale of Plum Island and would like to see the sale stopped in order to ensure that efforts to preserve the island are successful,” the lawmakers wrote. While the legislation would not permanently ban the sale, Crider said it would immediately halt all marketing, and that’s helpful to his cause. He said the GSA continues to take prospective buyers to tour the island, a practice he’d like stopped. The GSA website also notes the island’s “architectural highlights,” which include a lighthouse listed on the National Register of Historic Places that was built in 1869, and buildings and battery stations constructed as part of Fort Terry, a military fort actively used during the buildup to the Spanish-American War and during World War I and World War II. Workers and anyone else with permission to visit the island must take a ferry from Old Saybrook or from Orient Point. About 9.5 acres and the ferry landing at Orient Point are included in the sale’s prospectus.